Smile Concepts are delighted to introduce Janet (Jan) Kitchen, our Foot Health Practitioner. Jan will be responsible for looking after your foot health care. It is vital to maintain the health of our feet, being as the average person uses their feet to walk around 150,000 miles in a lifetime – the equivalent to walking around the world five times. Moreover, the foot is one of the body’s most complex ‘machines’ with a total of 26 bones. A Foot Health Practitioner (FHP) is qualified to provide routine foot care and maintenance for your feet. They can assess the condition of your feet and treat as appropriate, or if necessary refer you to a specialist. Whatever your age, looking after your feet is one of the most important aspects of personal health care. Our feet are with us our whole lifetime and an increasing number of people need some form of simple foot care to maintain the wellbeing of their feet and ensure they remain mobile, with an excellent quality of life. Please see below for the full list of treatments provided here at Smile Concepts Foot Health Clinic. The appointment starts with a medical history check and a vascular assessment. A foot bath is used, then nails are cut and filed, and any hard skin and corns are removed. Followed by cream applied to the feet and advice is given to help maintain healthy feet. The appointment starts with a medical history check and a vascular assessment. The nails are cut and filed, and then cream is applied. New patients have to be seen for a full treatment prior to being booked in for a toe nail cutting appointment. Toe nails can be painted following a foot health treatment or nail cutting. The patient must provide their own nail varnish, and the reception team must be told at the time of booking that they require the extra time for the toe nails to be painted. The appointment starts with a medical history and a lower leg and foot assessment. A foot bath is used, soothing and relaxing music is played as oil is massaged into lower legs and feet to the pressure of the patients’ preference. A cooling and refreshing spray is used to complete the treatment. 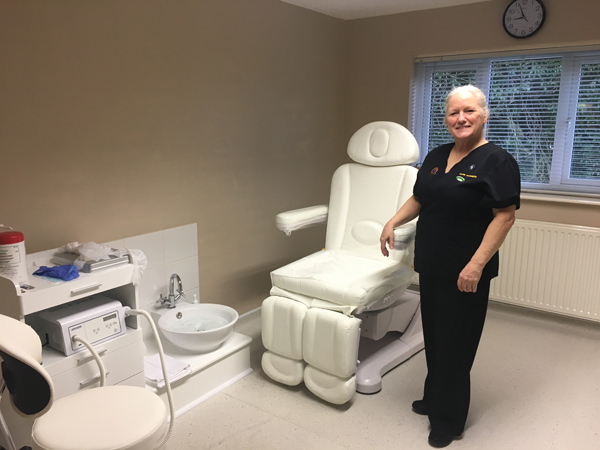 Jan, our Foot Health Practitioner, can also advise on products that can be purchased to help adequately maintain your feet.